Hailea Adjustable Air Pumps are a highly developed range of air flow systems designed specifically for aqua farms and hydroponic reservoirs. The pump provides a steady flow of air that is easily regulated to your desired strength of litres per minute by adjusting the flow regulator dial on each particular 1, 2, 4 or 8 outlet unit. Each unit has been designed with a multi-level muffler to reduce noise levels and rubber feet to minimise vibration. Hailea air pumps are low maintenance and manufactured using high quality materials to provide you with an effective air flow system with minimal upkeep and power consumption. Hailea Adjustable Air Pumps are available in a range of outlet versions from 1, 2, 4 and 8 to suit your requirements. This single outlet adjustable pump is capable of producing 0.4 to 3.2 litres per minute which can be adjusted to suit your needs and has a low power consumption of 2 watts. 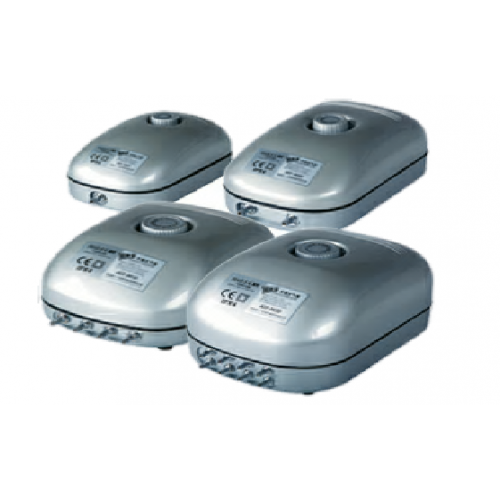 A dual outlet air pump provides 0.8 to 7.2 litres per minute and just 5 watts of power consumption. With 8 outlets this adjustable air pump can output 2.3 to 16 litres per minute with just 15 watts power consumption.